An early example of a “daguerreotype.” Paris Boulevard is a significant step in the development of photography. Taken in 1839 by Louis-Jacques Mande Daguerre, the photograph depicts a seemingly empty street in Paris. The elevated viewpoint emphasizes the wide avenues, tree-lined sidewalks, and charming buildings of the French capital. However, the obvious day light of the photograph begs the question – where are all the people in this normally busy city? The answer to this question lies in the daguerreotype technique. 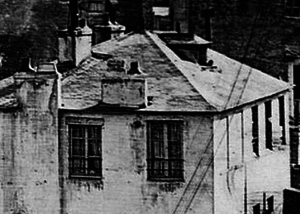 The first photographs, such as Joseph Nicephore Niépce’s famous View from the Window at Gras, took about 8 hours to expose, creating indistinct, grainy images. Daguerre was intrigued by these experiments and formed a partnership with Niépce from 1828 until the latter’s death in 1833. Daguerre continued to refine the photographic method until he developed his new process. His technique consisted of exposing a copper plate coated in silver and sensitized with iodine to light in a camera, and then developed it in darkness by holding it over a pan of heated vaporizing mercury. He also developed a method of creating a permanent image by using a solution of ordinary table salt. 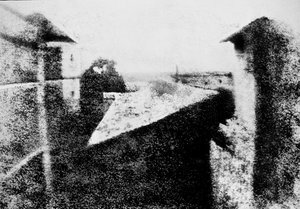 Daguerre’s technique significantly reduced exposure time and created a lasting result that would not dim with further exposure to light, but only produced a single image. It would be up to others to produce the negatives that allowed for the production of multiple copies of an image. 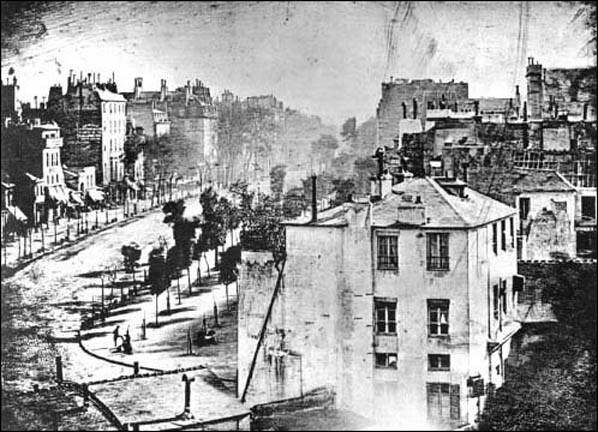 Daguerre’s Paris Boulevard shows the advantages of the new technique. There is far more detail than in earlier photographs. We can clearly see the panes in the windows and the sharp corners of the building in the front of the image. The objects are no longer blurry masses of light and dark, but defined and separate structures. In fact, the only thing missing are the people, except for the small figure of a man having his shoes shined at a sidewalk stand. The remaining problem of the daguerreotype, at least by modern standards, was the long exposure time, between 10 and 15 minutes. This meant that the people hurrying along those spacious sidewalks did not register on the photograph. The man having his shoes shined, possibly the first photographic image of a person, obviously stayed still long enough to register on the image. The haunting empty, yet evocative, image of Paris Boulevard shows both how far photography had come in a short time and how much farther the technology still had to advance. Cite this page as: Dr. Rebecca Jeffrey Easby, "Louis Daguerre, Paris Boulevard," in Smarthistory, August 9, 2015, accessed April 18, 2019, https://smarthistory.org/daguerre-paris-boulevard/.